Call (610) 377-3268 for additional information. Located at 701 Bridge St., Lehighton, PA. Body and Soul Storage has 130 storage units available for rent. Secure and safe with 24-hour hour surveillance, rest assured you and your valuables, will be safe at this facility. This storage facility is clean and well lit and accessible seven days a week. Usage - Available for residential or commercial storage. Hours : Monday through Thursday from 9 a.m. to 5 p.m., Friday, 9 a.m. to 4 p.m. and weekends by appointment. Plans also exist for another storage building erected that will house another 60 units as these units fill. 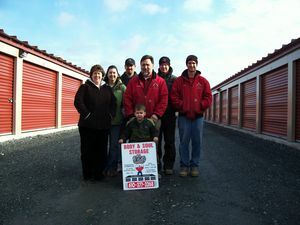 Body and Soul Storage is a family-run business and continue to look forward to providing the area with quality storage facilities.